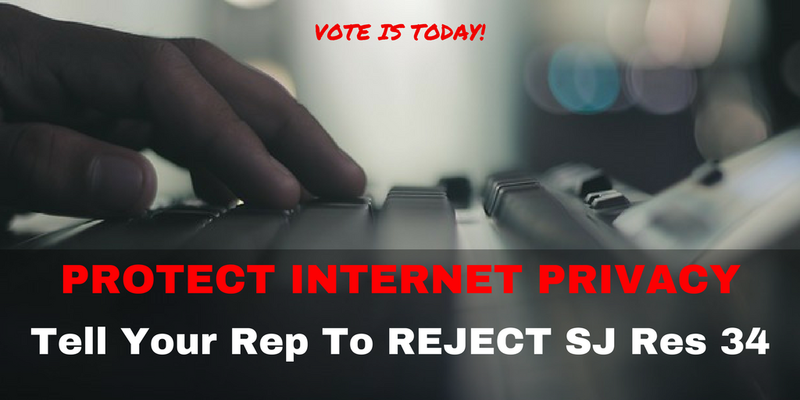 Daily Acts of Resistance: Call ASAP To Protect Your Privacy - Vote Is TODAY! Call ASAP To Protect Your Privacy - Vote Is TODAY! First of all, congratulations on helping to defeat the hateful AHCA last week. It feels really good, right?! There's still a long fight to protect the ACA from Republican attempts to sabotage it but for now, we'll turn our attention to something much more pressing - Congress is poised to repeal essential regulations that protect your privacy online TODAY. The legislation passed the Senate by two (Republican) votes last week and the House is moving quickly now to do the same. It's called S.J. Res. 34, a resolution that would invalidate the Federal Communications Commission's privacy rules and prevent the FCC from issuing similar regulations in the future. Wanna guess how the Republican-controlled House is likely to vote???? 1. Call your Representative as soon as the phones open today (Tuesday). Find your Rep if you don't already have her or him in your phone. 2. You may have to try several offices before you get through to a staffperson. When someone does pick up, here's your script: "Hi, my name is ___ and I'm calling from ___ to urge Rep. ___ to protect my online privacy by voting NO on S.J. Resolution 34 later today. I do not want Internet service providers to be able to sell my data without getting my permission." Then thank them for taking your call. Always be polite. Also, if your Rep. is a Republican member of the House Committee on Rules -- here's the list: Sessions (TX), Cole (OK), Woodall (GA), Burgess (TX), Collins (GA), Cheney (WY), Buck - CO, Newhouse (WA), Byrne (AL) -- he or she has already voted last night to move this forward and you should definitely mention your disappointment with that vote. 3. Forward this email to ten friends and ask them to join you in calling their Reps before noon. 4. Share this on Facebook and Twitter.